The steel anomalies in the reactor vessel of the EPR in Flamanville and many steam generators have led to one of the most serious crises faced by the French nuclear industry. 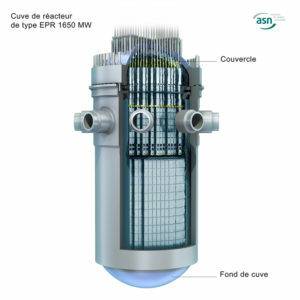 The report of the High Committee on Transparency and Information on Nuclear Safety (HCTISN) highlights the absence of precise information from Areva and EdF on the serious problems affecting the reactor vessel of the Flamanville EPR . The finding would be the same for steam generators. ACRO, therefore calls for more transparency. The association made an inventory of the available documentation and reconstructed a chronology of the events on a dedicated website: http://transparence-nucleaire.eu.org. Find the full press release of ACRO published on 21.06.17 in french here. On 8 December 2016, Christiana Mauro and NTW made a request access to the documents connected to the legal assessment of infringement proceeding 2015/4231 initiated by the Commission against Hungary with regard to the public procurement process for the Paks Nuclear Power Plant refurbishment and new reactor construction. In addition, they also request the Commission to provide any additional documentation related to the investigation that may be available under Regulation 1049/2001, including the legal analyses conducted by the Commission services, internal notes and documents, correspondence and reports. On 19 January 2017, NTW and Christiana Mauro received a refusal informing that their application cannot be granted, as disclosure is prevented by exception to the right of access laid down in Article 4 of this Regulation. On 22 February 2017, following this request for access to documents of 8 December 2016, NTW and Christiana Mauro submitted a confirmatory application in accordance with Article 7(2) and 7(4) of Regulation (EC) No 1049/2001 of the European Parliament and of the Council of 30 May 2001 regarding public access to European Parliament, Council and Commission documents. They ask to reconsider the position taken as regards the request for the legal basis of the conclusion of infringement procedure NIF 2015/4231, to which access has been refused. A one-day conference with international experts has focused on the Euratom directive on management of spent fuel and radioactive waste (Council Directive 2011/70/Euratom) in Budapest on 15 December 2016. The status of implementation in EU member states and whether this directive will „solve“ the issue of waste disposal have been analyzed. To illustrate the effectiveness or non-effectiveness of this directive, national cases were observed. Hungary was an example of a country (not the only one) still considering the export of spent fuel to the Mayak facility in Russia. This conference also provided up-to-date information on the situation at Mayak and the Hungarian plans for spent fuel from Paks I and Paks II. A report of the conference and speakers presentations are available on the Joint Project Website. On 9 February 2017, Nadja Zeleznik, Chair of Nuclear Trasparency Watch wrote to Mr. Ramzi Jammal (President of the 7th Review Meeting of the Convention on Nuclear Safety (CNS) ) and Mr. Yukiya Amano (Secretary General of the IAEA) about NTW concerns on the law changes in Hungary and the issue of regulatory independence. NTW was informed about changes in the Hungarian energy legislation that undermine the independent position of the nuclear regulator, the Hungarian Atomic Energy Agency (HAEA). This situation could seriously compromise transparency during the construction of nuclear projects and nuclear waste management, as well as fundamentally impair nuclear safety. This letter recommend to discuss this matter during the 7th Review Meeting of the Convention on Nuclear Safety.